It was founded 28th November, 1853, by King Maximilian II. as a distinction for prominent talents in the Arts and Sciences, and more especially for German savans and artists. It is divided into two parts : the Arts and the Sciences. The decoration consists of a Gothic Cross, enamelled dark blue with white edges, and four rays in the corners, and surrounded by a wreath of laurel and oak leaves. The middle of the Cross forms a shield, the front of which exhibits the effigy of the founder, with the inscription, "Maximilian II. Konig von Baiern", while the reverse represents either an owl (as symbol of science) or - for the division of the Arts - Pegasus, with the inscription, "Für Wissenschaft und Kunst" (For science and art). Within the points of the Cross are to be seen the words "28th November, 1853" (the foundation day). It is worn round the neck, suspended by a dark blue ribbon with white borders (No. 35). The King is Grand Master of the Order. The Chapter consists of seven or nine members, who annually meet in November to deliberate on the merits of the candidates. The number of members is limited to one hundred, with a due regard to the proportion of the two departments, the arts and sciences. 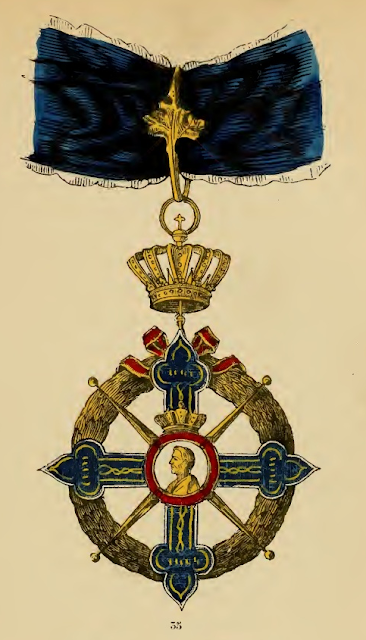 The Order is not hereditary, and the insignia are returned, after the demise of a member, to the Minister of State of the Royal Household and Foreign Affairs.